It’s a nightmare for the Postman, Couriers and visitors trying to find the correct address when properties don’t have visible house number plaques or signs. Whether you are looking for house number plaques for a residential or a commercial property within the Northampton area we can help. Over the years fashions and trends change. Acrylic house number plaques and slate house number signs are currently very popular. We like to give honest advice on the merits of all materials rather than sell you the most expensive option. For example our Corian house number plaques are cheaper than Slate but look just as professional. Corian is also very durable and require little or no maintenance (unlike brass). At the most basic level we can supply vinyl numbers or letters that you stick straight onto your door. These are available in a range of colours. For a more professional look you may want to consider one of our engraved house number plaques. These include materials like Brass, Plastic, Slate, Foamalux and Corian. Corian can be infilled with either black or white paint. Of course you can also stick vinyl numbers to Corian or Foamalux but it looks less professional than deep engraving. Corian is the brand name for a solid surface material. Its primary use is as a countertop/benchtop surface, though it has many other applications. Foamalux is foam PVC sheet. Light in weight, versatile, durable and has earned a reputation for quality performance and endless applications in sign, display and print. We use our computerised engraving machines to deep engrave on all of these materials. They all differ in thickness with Brass and Plastic from 1.5mm to Corian being 12mm thick, the shapes vary too. 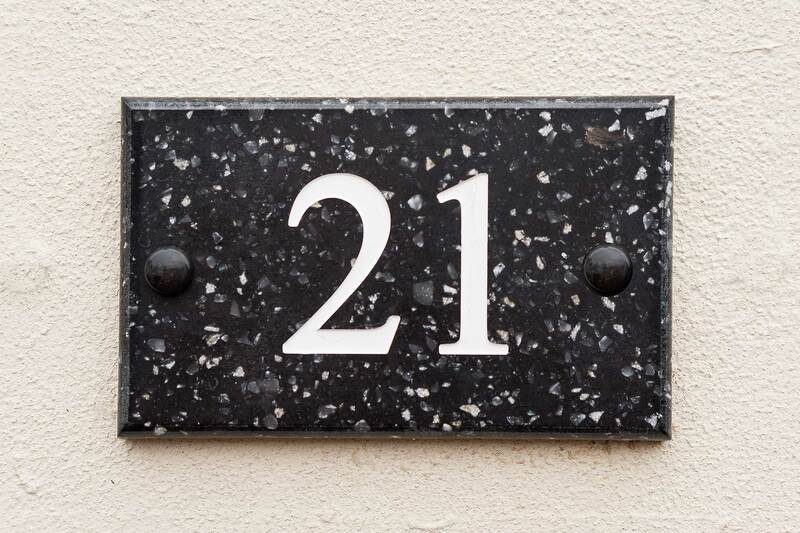 Although there are a few sizes of house number plaques that we engrave on a regular basis we have discovered that there is no such thing as a “standard” size. It all depends on where you are fixing the house sign as well as the size and number of characters you are putting on it. Because of this we will usually set out the house sign on the computer. This allows us get a more accurate idea of sizes and shows the customer how it will look. Sometimes the size the customer asks for is too small or too big and this can affect the final price. I really enjoy engraving on Corian. It’s a sturdy material that engraves nicely and cleans up really well after infilling with paint. From the customer’s point of view Corian requires less maintenance than Brass and is cheaper than Slate. The image that accompanies this article is an example of a Corian house number plaque that we engraved recently for a customer. We stock a few different colours but not in all sizes. Why not visit our trophies and engraving page to find out what other engraving services we offer. If you are looking for engraved brass memorial plaques you might like to watch the following YouTube video. I had my house number plaque done by Northampton Locksmiths and I’m very happy with it. We went for Corian and it looks good and seems to be fit and forget with no maintenance. Thanks for the comment. We are pleased that you love your new house number plaque. I knew you would like Corian, it looks good, is easy to live with and cheaper than some alternative materials.